Hi! Designer Chris showcasing another amazing new Sparkle N Sprinkle stamp, which was released in the February 2018 release. This one is a digi only - and boy is it fun! It is the Snowman With a Heart digital set. Let's check out the card together! I sized the digital image and sentiment on my computer, and then printed them out onto cardstock. I also printed two of the exact same sized images of the snowman so I could fussy cut some parts. I die cut the snowman image (more on this below) with my Tonic Tangerine machine, using the Tonic Ornate Frame Layering Die. I had to partial die cut the snowman because I wanted his little stick hands to poke out over the outer edge of the die. Once he was die cut, I fussy cut around his hands. I used the second copy of the snowman I printed out to pillage for more body parts! I fussy cut the hat part for the snowman. You can see the second layer of the hat (just the cap part, not the brim) that I added as the second layer. I rolled on some Sakura Glue Pen onto the holly berries and leaves, and the hat itself. I sprinkled on Pink Fizz, Shamrock, and Sterling glitters to these areas. I used foam adhesive squares to add dimension between the layers. I also did the same with his nose - I fussy cut it from the second image I printed, and rolled on some Sakura Glue Pen and sprinkled on Tangerine glitter. I used foam adhesive squares here too. Then, I squeezed on some Ebony Black Crystal Drops to make his charcoal smile a little more dimensional too. This worked out great! Here are more fussy cut parts ... I fussy cut his little heart buttons. Rolled on more Sakura Glue Pen and sprinkled on more Pink Fizz glitter. Adhered them with foam adhesives for added dimension. 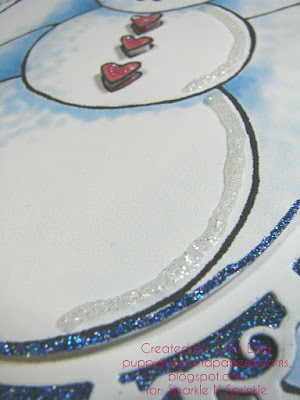 Another thing I did was to squeeze out a strip of Nuvo Fresh Snowfall Glitter Accents onto the "light" edge of the snowman. In my mind, the light is coming from the right of the image, so I added a strip of the Glitter Accents there to give it some highlight. This was a really fun embellishment that gave some nice sparkle! 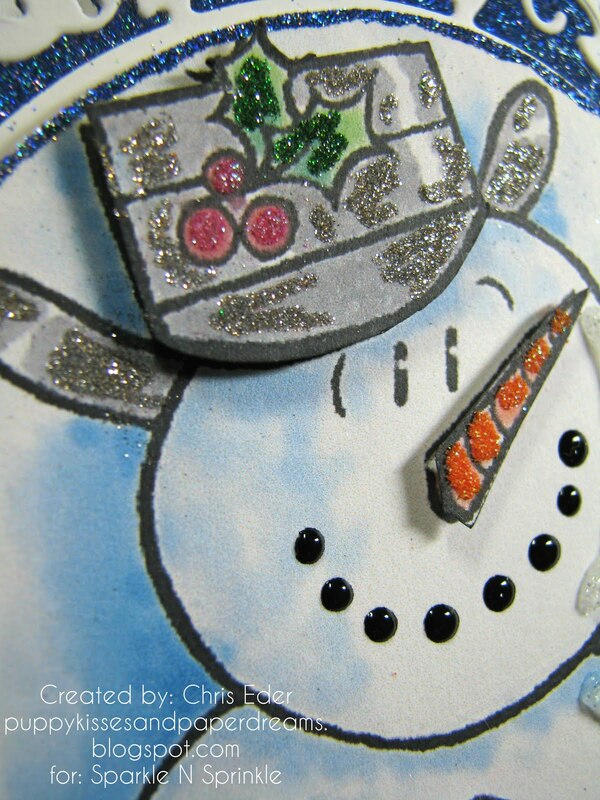 Here is a close up of the partial die cutting and fussy cutting to allow the snowman's hands to stick out from the die cut edge. I put the whole oval shape onto an Action Wobbler and layered it over another full image of the snowman I printed out. I lined it up so his hand "held" the sun heart in the background. When the oval layer wobbles, his hand bobs up and down under the heart! It is so cute in real life! I embellished the heart with some more Sakura Glue Pen and more Pink Fizz glitter! I also layered another die cut layer under my oval (before mounting all of it onto the Action Wobbler). I put down some 3/4" Tear-ific Tape around the outer edges of the cardstock of where I would be die cutting. I die cut another oval from the Ornate Frame Layering Die Collection, and then pulled away the release tape on top of the die cut negative spaces, and pressed in Marine Blue glitter. 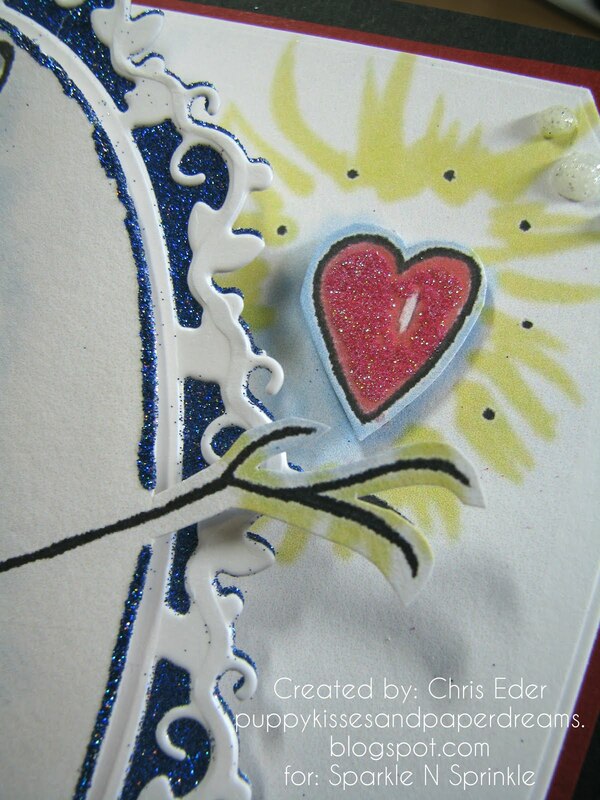 I also swiped some Sakura Glue Pen around the inner oval, and sprinkled on more Marine Blue glitter there. 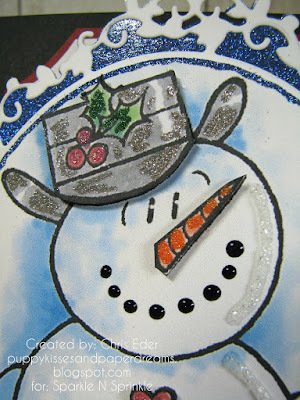 This gave a nice strip of sparkle all around the Snowman Oval. 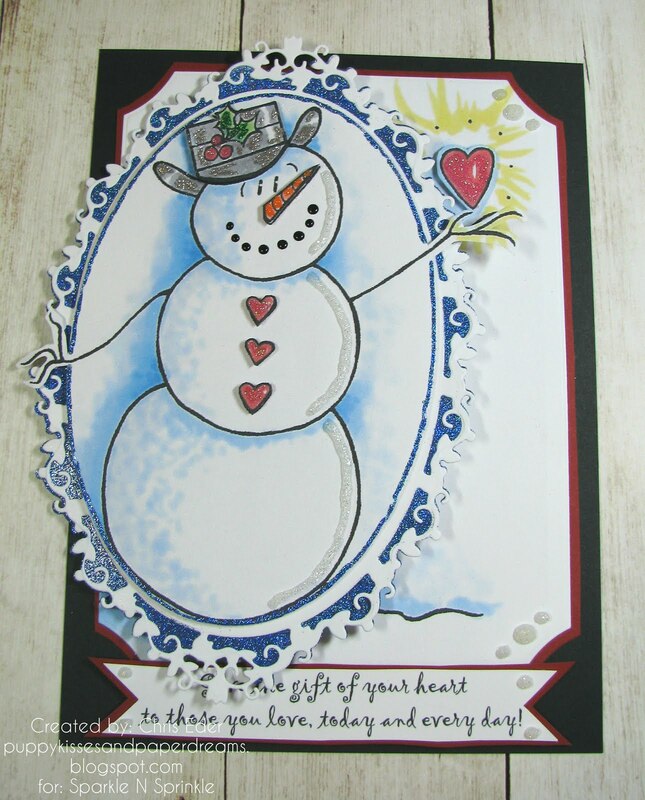 I layered the snowman oval onto two layered pieces of white and red cardstock that I created using the Swirling Frame Layering Die Set. I backed it all onto a black cardstock card base, and this card was done. This snowman is super sweet and a lot of fun! I can't wait to see what you create, and look forward to seeing your awesome creations in our monthly Sparkle N Sprinkle Creative Challenge that you can find on Facebook. The challenge runs monthly from the first day of the month to the 25th. So, post your cards and projects starting March 1! You can win a prize!! !